Boat Sales Looking to buy a used boat? Look no further! Whether it be for cruising, fishing, camping or entertaining, you'll receive hassle-free courteous service from our professional sales staff. Please browse our used inventory, or, if you don't see what you're looking for, please let us know and we'll try to find it for you. Financing is also available. Dockage Our 4 pad boat ramp leads out of our channels and into Long Point's outer bay. Our 750 seasonal boat slips and 20 boathouses vary in price according to the size of boat and the services with the slip. For visitors to the area, we also offer transient boat slips throughout the marina and at the marina's pier. Gas Dock Our energetic, friendly staff is waiting to greet you and help you get underway for your day of boating or fishing. Whether you need gas, snacks or supplies, come share the sunshine, blue waters and fresh air with the staff here at MacDonald Turkey Point Marina. 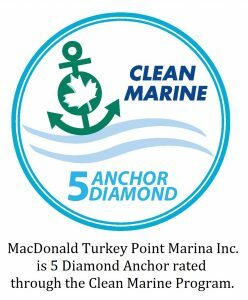 MacDonald Turkey Point Marina is Canada's largest freshwater marina and your number one source for everything boating. Serving customers from all over Canada the United States, we have 750 seasonal boat slips and 20 boathouses located within 80 acres of beautiful land, a full service marine maintenance and detailing department, used boat sales, boat parts and accessories sales and a 79 site seasonal mobile home trailer park. Lake Erie is a great freshwater fishing destination for large mouth and small mouth bass, yellow perch, northern pike and many others, while Long Point Bay itself is one of North America's leading bass fisheries. If you're not into fishing, the area beaches can't be beat, plus there are a number of boating destinations such as Pottahawk, a remote beach only accessible by boat that's known for it's unofficial party on the second Sunday of July each year. Port Dover is a very popular destination for a great meal at one of the many restaurants or to do a little shopping. Several festivals also take place in the area during the summer - why not check one out. Heading across the lake to Erie, Pennsylvania is another destination for customers to attend events or to go shopping. Situated on south coast of Norfolk County, we're surrounded by award winning wineries, a wide variety of agri-food businesses, wilderness adventure parks, golf courses as well as nature and mountain bike trails. There are so many possibilities, so please come check us out. The local area has so much to offer!